Turkey is increasingly at the crossroads of the world energy trade. Because of tanker traffic through the Bosporus and Dardanelles straits, Turkey has become an important north-south oil transit route. The Baku-Tbilisi- Ceyhan (BTC) oil and Baku-Tbilisi-Erzurum (BTE) natural gas pipelines make Turkey an important east-west route as well. Economic opportunities, however, can present diplomatic liabilities. As the importance of Turkey's energy sector has grown, Turkey has come under increasing pressure. Turkey finds itself caught between competing U.S. and Russian interests as a result of the August 2008 Georgia conflict. Turkish-Iranian energy trade has also brought Washington's ire down on Turkey. Turkey's efforts to minimize problems with its neighbors may make it popular with some, but it has led others to question the strength of the U.S.-Turkish strategic partnership. Analysis of Ankara's options show that it has little choice besides greater caution and engagement, and that energy concerns rather than a reassessment of its Western ties motivate its outreach to Russia and, to a certain extent, Iran. 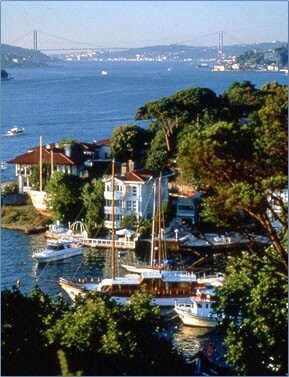 Istanbul straddles the Bosporus with a population of thirteen million. Over the last decade, oil tanker traffic on the strait has increased 240 percent. No other city in the world is exposed to the transit of such volatile cargo every day. Historically, U.S.-Turkish relations have been strong. Throughout the Cold War, Turkey was a staunch member of the North Atlantic Treaty Organization (NATO). Along with Norway, it was the only NATO country to border the Soviet Union. The Soviet Union's collapse fundamentally altered Turkey's geopolitical position. To the east, Turkey found itself a neighbor to three new countries: Azerbaijan (through the Nakhchivan enclave), Armenia, and Georgia. The Warsaw Pact's demise made neighboring Bulgaria a promising new market. And the Black Sea, once the proving ground of the Turkish and Soviet navies, suddenly became a much friendlier place. It was not long before Turkish businessmen began exploring new economic opportunities. Analysts and politicians have explained the rapprochment as "ever closer cooperation and [a] multidimensional partnership." At the same time, many U.S. analysts and officials worry that Ankara's warming ties with Moscow signal a decline in the U.S.-Turkish alliance. It need not be like this, however; rather, the growing Turkish-Russian relationship is based on the economic interests of both countries. In many ways, the private sector has driven Turkish-Russian rapprochement. In 1990, Turkish-Soviet trade was $1.7 billion. A decade later, it was $4.5 billion. By 2007, bilateral trade between Turkey and Russia reached a record $28 billion, albeit with an $18.6 billion Turkish trade deficit. In the first nine months of 2008, bilateral trade had already reached $30 billion with a total trade volume expected to reach $36 billion for the year. Whereas Germany was Turkey's number one trading partner up to 2007, today Russia has taken its place. Indeed, Turkish-Russian trade is now, by volume, almost three times that of U.S.-Turkish trade. In 2002, both countries completed the 16 billion cubic meter/day capacity Blue Stream pipeline, running from the Beregovaya compressor station in Arkhipo-Osipovka to the Durusu terminal located 38 miles from Samsun, Turkey. Gas flow from Russia to Turkey started in February 2003. However, because of a price dispute between the two countries, the inauguration ceremony could not be held until November 17, 2005. Energy cooperation—both gas and oil—forms the basis of Russo-Turkish economic relations. Gas is Turkey's major import. In 2007, Turkey imported 23.15 billion cubic meters of natural gas through both western and Blue Stream pipelines, up 18 percent from the year before. Turkey, as the third largest importer of Russian gas after Germany and Italy, depends on Russia for almost two-thirds of its gas imports. If Turkey cannot tap other major supplies from Azerbaijan, Iraq, and Turkmenistan by the early 2010s, then the Russian share of Turkey's gas supply will increase to 80 percent of the total. In addition, Turkey imports approximately six million barrels of oil (seven million tons) annually from Russia, 30 percent of Turkey's total oil import and second only to that purchased from Iran. Turkey is also the third largest importer of Russian coal following Ukraine and Great Britain, spending $710 million in 2007. It is not just geography and energy that make Russia such an attractive trading partner for Turkey. Even though Russia's population is twice that of Turkey's, if the energy sector's contribution is subtracted, the Russian economy is smaller. Flush with cash from the still underdeveloped oil boom, Russia provides Turkish industry with ample opportunity. Turkish contractors have engaged in projects worth close to $28 billion; $5 billion in 2007 alone. In addition, Turkish direct investments in Russia reached $6 billion by the end of 2007. Tourism has also helped cement relations. In 2007, 2.5 million Russian tourists visited Turkey, almost four times the number of American visitors. In only the first six months of 2008, Turkey welcomed two million Russians. Both Ankara and Moscow encourage this trend, which is unprecedented in the history of the two countries. According to the memorandum of understanding signed in 2006 between the Turkish Ministry of Culture and the Russian Federation's Federal Agency for Culture and Cinematography, Ankara named 2007 the year of Russian culture in Turkey. Moscow reciprocated and declared 2008 the year of Turkish culture in Russia. On October 20, 2008, the Red Army Chorus and the Ottoman Army Military band (Mehter) gave a joint concert in the Kremlin. Such a concert may seem a side note to a U.S. audience, but for both Turks and Russians, it had immense symbolic meaning, given that the Russian and Ottoman armies had clashed eleven times in major battles in the course of history. Few Turks ever expected a "Janissary" soldier to sing "Kalinka" in the Kremlin Palace. The leaders of both Turkey and Russia have encouraged further bilateral developments. On December 5-6, 2004, Russian president Vladimir Putin paid his first bilateral visit to Turkey, the first by a Russian head of state since 1972 when Nikolai Podgorny, the chairman of the Presidium of the Supreme Soviet of the USSR, paid a symbolic visit to the country. Putting aside Podgorny's visit, Putin's was the first state visit by a Russian head of state since the beginning of official diplomatic relations 512 years before. During the visit, Putin and Turkish president Ahmet Necdet Sezer signed a joint declaration of cooperation which characterized bilateral relations as a "multilateral strengthened partnership." The following year, Turkish prime minister Recep Tayyip Erdoğan visited Russia three times, and Putin returned to Turkey to mark the opening of the Blue Stream pipeline. On June 28-30, 2006, Sezer became the first Turkish president to visit Russia, and his successor, Abdullah Gül was scheduled to visit Moscow in January 2009. In contrast, during this period, U.S. Secretary of State Condoleezza Rice visited Turkey only twice (February 5-6, 2005, and April 25, 2006) and National Security Adviser Stephen Hadley just once. Nor are the Russo-Turkish visits just symbolic. In follow-up agreements to the Turkish-Russian partnership, the foreign ministries of both countries established a bilateral consultation mechanism to cover twelve different subjects in February 2006. The commission held meetings in November 2006 and June 2008. In contrast, the United States and Turkey do not enjoy such a comprehensive, regular mechanism for meetings or developing relations. Instead, because of the difference of opinion over the invasion of Iraq, they started in July 2006 to have irregular "Shared Vision and Strategic Dialogue" meetings. Although it is one of the key strategic partnership topics for Ankara and Washington, the parties were able to establish a working group on energy issues only in the summer of 2008. Turkey's energy strategy has three main pillars. The first is to ensure diversified, reliable, and cost-effective supplies for domestic consumption; the second is to liberalize its energy market; and the third is to become a key transit country and energy hub. Three quarters of the world's proven oil and gas resources are located in regions neighboring Turkey, and there is an increasing dependence on Russian, Caspian, and Middle Eastern oil and natural gas by Europe, the United States, and developing East Asian countries. Approximately 3.7 percent of the world's daily oil consumption transits the Turkish Bosporus and Dardanelles straits. While this is currently only one-fifth of the traffic that passes through the Strait of Hormuz, it still represents a 240 percent increase in traffic over the last decade. Two-thirds of these tankers carry Russian oil and gas exports; most of the bulk cargo trade is also Russian. This creates a problem for Turkey, however. Istanbul, its largest city, straddles the Bosporus with a population of thirteen million. The 19-mile-long Bosporus has a convoluted morphological structure that requires ships to change course at least twelve times, including four separate bends that require turns greater than 45 degrees. At Kandilli, a blind 45-degree bend complicates navigation where the channel narrows to less than half a mile. At both Kandilli and Yenikoy, forward and rear lines of sight are blocked during turns. Moreover, two bridges built in 1973 and 1988 spanning the channel increase the navigational threats. Approximately 1.5 million people cross the waterway daily on intercity ferries and shuttle boats, accounting for about 1,000 east-west crossings. No other city in the world is exposed to the transit of such volatile cargo every day. Planning for an accident in the congested shipping passage is every Istanbul waterway official's nightmare. All Turkish officials remember the conflagration that followed a collision between two Cypriot tankers at the Black Sea entrance to the Bosporus on March 13, 1994. The accident killed twenty-nine crewmen, polluted the waterway with nineteen million gallons of crude oil, shut the channel for a week, and caused $1 billion in damage. Today, ships four times as large as those involved in the accident ply the waterway. Turkey has been lucky that there have been no more major accidents. Still, between 2004 and 2007 alone, there were 103 minor accidents in the Bosporus strait. Over the same period, 651 tankers experienced technical breakdowns or malfunctions in the passage. Shipping is no longer a sustainable way of carrying hydrocarbons through the Bosporus. Russian energy companies understand the gravity of the situation, and even as Moscow demands fulfillment of the 1936 Montreaux Convention's guarantee of "free and uninterrupted passage" through the Turkish straits, Russian officials and energy companies are aware that current traffic through the Bosporus is unsustainable. The solution lies in the use of alternative oil export options that bypass the straits. The Blue Stream natural gas pipeline is one of the main components of a north-south axis alternative transport strategy. In 2007, Turkey imported 9.3 billion cubic meters of Russian gas through Blue Stream; the figure for 2008 is likely to be 25 percent higher. The Turkish Ministry of Natural Resources and Energy regards the implementation of gas transit projects through Turkey to third markets as possible new projects to strengthen Turkish-Russian energy cooperation. Turkey also has begun work on other pipeline bypass options. While the Trans-Thrace pipeline has been cancelled because of environmental concerns, the Samsun-Ceyhan project (also called the Trans-Anatolian pipeline) broke ground at Ceyhan on April 24, 2007, in a joint venture between Turkey's Çalık Energy, Italy's Eni, and the Indian Oil Corporation (IOC); it is expected to have a capacity of 60 million barrels annually (70 million tons). Ceyhan provides distinct advantages for its existing infrastructure and linkages to the Baku-Tbilisi-Ceyhan pipeline. Originally meant to terminate at Samsun, its directors calculated that Unye, a small town in eastern Samsun province, would allow larger offshore facilities while reducing the total length by sixty miles. The proximity of Unye-Samsun to the oil outlets of Novorossiysk, Supsa, and Batum on the eastern Black Sea minimizes seaborne transportation of oil in the Black Sea. While environmental concerns have also caused Turkish officials to oppose plans for an oil terminal in the Aegean Sea, there has been preliminary progress on the potential Medstream project, which envisions a network of pipelines to supply oil, natural gas, electricity, and water, possibly along with a fiber optic line from Turkey to Israel by connecting the Blue Stream and Samsun-Ceyhan pipelines to Israel's Ashkelon-Eilat pipeline. Feasibility studies have been positive, and Israeli demand would enable Russia's state oil company, Gazprom, to fill the Blue Stream pipeline although progress has stalled as Moscow and Jerusalem have yet to agree on a contractor to lay the pipeline from Ceyhan to Ashkelon. Despite frequent Iranian declarations of contracts and partnerships, since 2001 Turkey has been the only significant importer of Iranian gas. Turkey signed the Iran contract in 1996, during the short tenure of the Refah Party, whose leader Necmettin Erbakan's Islamist leanings later led to public pressure for his resignation. While the Islamic Republic is Turkey's second largest gas supplier after Russia, Ankara's dealings with Tehran have not been easy. Iran often demands prices higher than those of alternative suppliers, and gas quality and quantity often fall below the terms agreed. Even after renegotiation, Iran currently supplies Turkey with a little over half of its contracted 9.6 billion cubic meters of natural gas a year (6.16 billion cubic meters in 2007). In both January 2007 and January 2008, Tehran slashed gas exports to Turkey in the face of high Iranian domestic demand. Turks certainly do not always consider Iran a reliable partner. Ankara and Tehran have also come to loggerheads over Iran's failure to respect commercial contracts. On May 8, 2004, the Islamic Revolutionary Guard Corps forced the expulsion of the Turkish construction consortium TAV from Tehran's flagship Imam Khomeini International Airport despite a 15-year service contract. That same year, the Iranian government also cancelled Turkcell's successful bid to enter the Iranian cell phone market. Still, under the ruling Justice and Development Party (AKP) chairman and prime minister Erdoğan's administration, there has been a renewed drive for energy partnership with the Islamic Republic. On July 14, 2007, Iranian oil minister Kazem Vaziri-Hamaneh and his Turkish counterpart, Hilmi Güler, signed a memorandum of understanding by which the two sides agreed to build 2,200 miles of gas pipelines to transport up to forty billion cubic meters of gas annually to Europe through Turkey. They also agreed to increase cooperation in electricity generation and to construct natural gas power stations. This would allow the Turkish state oil company, Türkiye Petrolleri Anonim Ortaklığı, to develop successive phases of the South Pars gas field, a $3.5 billion undertaking. But one year later, the energy accords remained formally unconcluded. Turkish-Iranian energy cooperation has angered Washington because it undercuts White House efforts to isolate the Islamic Republic over its defiance of three U.N. Security Council sanctions seeking suspension of uranium enrichment. Reuben Jeffery III, undersecretary of state for economic affairs, urged Turkish officials to bypass Iran and develop alternatives in the Caucasus and Central Asia. U.S. energy secretary Samuel Bodman and undersecretary of state Nicholas Burns have traveled to Ankara to underscore U.S. displeasure. Burns even alluded to possible application of the Iran Sanctions Act which would enable the U.S. government to sanction any company investing more than $20 million in the Iranian hydrocarbon sector. Erdoğan, however, has shrugged off Washington's displeasure and said Turkey seeks diversified energy supplies. It would be "out of the question to stop imports from either country [Russia or Iran]," Erdoğan said following the Georgian war, especially as Turkey's energy needs grow by almost 6 percent per year. The August 8, 2008 Russian invasion of Georgia has complicated Turkish strategy. Immediately after the invasion, Anatoly Nogovitsyn, deputy chief of Russia's General Staff, warned Ankara that Moscow would hold Turkey responsible for allowing U.S. navy ships through the Turkish straits to provide humanitarian assistance to Georgia should U.S. ships remain in the Black Sea for more than three weeks, as stipulated by the Montreaux Convention. According to some analysts, in apparent retaliation for allowing the U.S. ships passage, Russia has imposed new import controls on trucks at Russian border points. Russian foreign affairs minister Sergei Lavrov's September 2, 2008 visit to Turkey failed to resolve the dispute although he denied any connection with the U.S. ships' passage to the Black Sea. Some Turkish trade officials say—depending upon the timing of final resolution of the problem—Turkey may lose roughly $3 billion because of these new Russian restrictions. Turkey's leaders are treading carefully around the Georgia crisis. Although Turkey has called for Georgia's territorial integrity to be respected, it has refrained from embracing the stronger rhetoric coming out of Washington and Brussels. An explosion on the Turkish portion of the Baku-Tbilisi-Ceyhan pipeline three days before the Russia-Georgia conflict highlighted Turkish vulnerability, even if it were caused by technical error. Prime Minister Erdoğan walked a very tight rope, explaining to the Turkish daily Milliyet, "It would not be right for Turkey to be pushed toward any side. Certain circles want to push Turkey into a corner either with the United States or Russia after the Georgian incident. One of the sides is our closest ally, the United States. The other side is Russia with which we have an important trade volume. We would act in line with what Turkey's national interests require." Prime Minister Erdoğan's top foreign policy advisor Ahmet Davutoğlu explained, "You can't say that Turkish-Russian relations can be like Danish-Russian relations, or Norwegian-Russian relations, or Canada-Russian [sic] relations. ... Any other European country can follow certain isolationist policies against Russia. Can Turkey do this? I ask you to understand the geographical conditions of Turkey... We don't want to pay the bill of strategic mistakes or miscalculation by Russia, or by Georgia." As some analysts at Stratfor Intelligence Service put it, however, "Moscow got its point across: Europe can sink its money into projects designed to leave Russia in the cold [mainly east-west energy corridor projects like Baku-Tbilisi- Ceyhan, Baku-Tbilisi-Erzurum, and Nabucco], but the Russians still have the will and capacity to disrupt many of these projects." The Georgian crisis has shattered many of the assumptions in both the East and West about how oil and gas from the Caspian Basin can best be transported to international markets and, as a result, about the relations between producing and transit countries on the one hand and those two categories and the rest of the world on the other. Both Caspian Basin oil and gas producers and Western powers have wanted oil and gas export pipelines from that region to bypass Russia but, at the same time, have ruled out Iran as an alternative. Following the successful completion of the Baku-Tbilisi-Ceyhan and Erzurum pipelines and the first leg of the Turkey-Greece-Italy gas interconnector, the U.S.-Turkish "east-west energy corridor" concept envisions extending these pipelines east to Kazakhstan and Turkmenistan via the Trans-Caspian pipeline and west to Europe via the Nabucco pipeline between Turkey and Austria. This would, for the first time, allow the European Union to buy Caspian gas without a Russian intermediary. As a result, some Caspian Basin states are now considering exporting their hydrocarbons via Russia even if that gives Moscow leverage over them, while some Western countries that want to punish Russia are discussing allowing exports via Iran; still others are pushing to resolve the Karabakh crisis in order to allow the export of oil and gas via Armenia. No matter what solutions major powers pursue, the mere discussion of alternative energy strategies suggests old allies may come into conflict while old enemies may begin to cooperate. Perhaps the first major shift will be in Turkish-Armenian relations. On September 6, 2008, at the invitation of Armenian president Serzh Sargsyan, Turkey's president Abdullah Gül visited Armenia—a country with which Turkey does not have diplomatic relations—to watch the 2010 World Cup qualifier soccer match between their national teams. A second outgrowth of the Georgian crisis has been plans to create a "Caucasus Stability and Cooperation Platform" to include Armenia, Azerbaijan, and Georgia as well as Turkey and Russia. In principle, each country has agreed to support the initiative. Energy dominates Turkish strategic thinking. While the United States enjoys a relatively peaceful neighborhood, Turkey exists in a tough and complicated region. As Turkey continues to industrialize and develop into a regional hub, its thirst for oil will only increase. This requires not only diversification but also good relations with all its neighbors, in addition to and not to the exclusion of its traditional partnerships. Turkey simply does not have the luxury to remain aloof from its neighbors, even if they are Russia and Iran. Still, the Russian invasion of Georgia underlines the uncertainty that marks Turkey's diplomatic realignment. The future of Turkish-Russian energy relations and the north-south corridor depend largely on Moscow's vision of energy security for Europe and the world. Russian officials often point out that during the Cold War, they did not stop supplying oil to the West. While that is correct, it is equally true that the reputation of the Russian Federation as a consistent and trustworthy energy supplier is questionable. Moscow's use of energy as a trump card against Ukraine, Belarus, Latvia, Georgia, Azerbaijan, and the Czech Republic raised eyebrows. Even if Russian decision-makers perceive energy as not only an economic but also a political matter, energy bottlenecks due to political risks are always a possibility—a situation that will increase the legitimacy of energy policies aimed at creating alternative supply routes. This should make Turkey's long-term energy development important to the United States and Europe even if Washington remains upset at the short-term implications of Ankara's dealings with Tehran. Diversification of new energy supply routes remains crucial not only to Turkey's development but also for the West's energy security. Tuncay Babalı, Ph.D., is counselor at the embassy of the Republic of Turkey in Washington D.C. The views expressed in this article are the author's own and do not necessarily reflect those of the Ministry of Foreign Affairs of the Republic of Turkey. Igor Torbakov, "Making Sense of the Current Phase of the Turkish-Russian Relations," Jamestown Foundation, Washington, D.C. Oct. 11, 2007. Zeyno Baran, "Will Turkey Abandon NATO?" The Wall Street Journal, Aug. 29, 2008. Confidential report of the Commercial Counselor's Office of the Embassy of Turkey in Moscow, Nov. 11, 2008. "Trade with Turkey: 2007," Foreign Trade Statistics, U.S. Census Bureau, accessed Jan. 7, 2009; "Turkish-American Trade and Economic Relations," General Directorate of Agreements, Undersecretariat of the Prime Ministry for Foreign Trade of the Republic of Turkey, May 8, 2008. Annual Report 2007, BOTAŞ (Petroleum Pipeline Corporation), p. 49, accessed Jan. 7, 2009; "Natural Gas Sale and Purchase Agreements, Natural Gas Pipeline Activities," Portrait of BOTAŞ Activities, accessed Jan. 21, 2009; "Natural Gas and LNG Purchases," "(Gas) Trade Movements 2007 by Pipeline," BP Statistical Review of World Energy 2008, p. 30. Bill Powell, "Just How Scary Is Russia?" Fortune, Sept. 15, 2008. Interagency special 2007 report, International Contracting and Technical Services Department, Undersecretariat of the Turkish Prime Ministry for Foreign Trade. "Tourism Statistics for 2007," Ministry of Culture and Tourism of the Republic of Turkey, Ankara, accessed Jan. 8, 2009. Today's Zaman (Istanbul), Oct. 22, 2008. Axis Information and Analysis news service, Aug. 21, 2005. Turkish Embassy, Moscow, news release, June 29, 2006. Internal Turkish Ministry of Foreign Affairs Information Bureau Monthly Activity Announcement, Nov. 2006, June 2008. "Vessel Traffic Statistics in the Istanbul Straits 2003-2007," confidential report, Ministry of Transportation, General Directorate of Coastal Security, obtained from the Turkish representative to the International Maritime Organization. John C. K. Daly, "Tankers, Pipelines and the Turkish Straits," Eurasia Daily Monitor (Jamestown Foundation, Washington, D.C.), June 26, 2008. Anatolian News Agency (Ankara), Mar. 14-30, 1994. Turkish Daily News (Ankara), July 14, 2008; Agence France-Presse, Oct. 23, 2008. "Trade Movements 2007 by Pipeline," BP Statistical Review of World Energy 2008, p. 30. Reuters, Jan. 1, 2008; Agence France-Presse, Jan. 1, 2008; Voice of America News, Jan. 1, 2008. John C. K. Daly, "Iran and Turkey Energy Ties Deepen," Eurasia Daily Monitor, July 2, 2008; Press TV (Tehran), Aug. 13, 2007. Eurasia Daily Monitor, Nov. 21, 2008. Milliyet (Istanbul), Sept. 28, 2007; Radikal (Istanbul), Sept. 28, 2007. John C.K. Daly, "Analysis: Turkey Iran Energy Ties," United Press International, Nov. 30, 2007. Gareth Jenkins, "Turkey Determined to Press Ahead with Iranian Gas Deal," Eurasia Daily Monitor, Oct. 5, 2007. Hurriyet, (Istanbul), Aug. 25, 26, 27, 2008; Milliyet, Aug. 25, 26, 27, 2008; Turkish Daily New, Aug. 25, 26, 27, 2008. Deutsche Presse-Agentur (Hamburg), Sept. 2, 2008. Radio Free Europe/Radio Liberty, Sept. 2, 2008; BBC Monitoring European (BBC Monitoring/Factiva), Aug. 6, 2008; John Roberts, "Georgia Falls Victim to Pipeline Politics," BBC Analysis, Aug. 12, 2008. Bulent Aliriza, "Turkey and the Crisis in the Caucasus," Center for Strategic and International Studies, Turkey Project, Washington, D.C., Sept. 9, 2008. "Turkey's Top Foreign Policy Aide Worries about False Optimism in Iraq," Council on Foreign Relations, Sept. 19, 2008. "Turkey: Eyeing Central Asian Energy Ties," Stratfor Intelligence Service (Austin, Tex. ), Sept. 3, 2008. Paul Goble, "Assessing The Global Impact of Russia's Aggression in Georgia," Radio Free Europe/Radio Liberty, Sept. 3, 2008. Soner Cagaptay, "The Caucasus: Small War, Big Damage," Turkish Daily News, Sept. 8, 2008. Lindsey Alexander, "Seeking a Way Forward on Trans-Caspian Pipeline," Radio Free Europe/Radio Liberty, Sept. 2, 2008; Spiegel Online (Hamburg), Sept. 12, 2008. Goble, "Assessing the Global Impact of Russia's Aggression in Georgia." "Turkey: Energy Cooperation with Armenia and Azerbaijan?" Stratfor Intelligence Service, Sept. 12, 2008. Zaman (Istanbul), Aug. 19, 2008. Azeri-Press Agency (Baku, Azerbaijan), Sept. 24, 2008. Suat Akgün, "The Russian Federation as an Energy Supplier," Turkish Policy Quarterly, Summer 2007. Related Topics: Oil & Gas, Turkey and Turks | Spring 2009 MEQ receive the latest by email: subscribe to the free mef mailing list This text may be reposted or forwarded so long as it is presented as an integral whole with complete and accurate information provided about its author, date, place of publication, and original URL.